Quickly change keyboard hotkeys / shortcuts for all nuke nodes and menu items. For the optional shortcut context (0, 1, or 2), add that at the end of the line (which is 0 if you leave it empty). 1. Place the 'QuickShortcutEditor' folder in your .nuke folder. 3. Open the 'QuickShortcutEditor/Keyboard_Shortcuts.txt' files and set your own keyboard shortcuts! 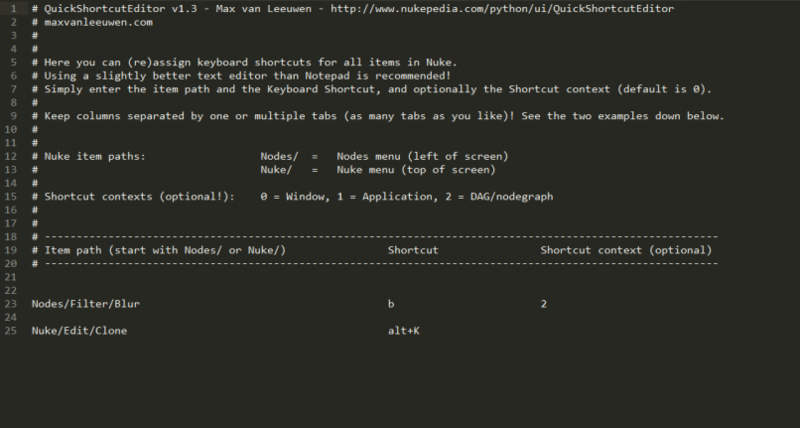 i just tried the script within your awesome nukeshared setup: unfortunately it works fine with windows but not with mac. I tried several Texteditors on mac, but none of them let me control more than one shortcut! it seems like it is a formatting issue, but i cant figure out what to do different. I tried textedit, sublime and the usual textedit. Thanks for letting me know! Will look into that soon! Hiya! It's been a while, but it should work now! I'm updating NukeShared soon, and this will be in there as well.